Practice, Practice, Practice, Practice really does make perfect. The first thing any artist asks me is, how did you learn to draw like that?! The actual answer, cliche though it may be, is practice. Now, before you slam your head on your keyboard and walk away, I’m going to share some thoughts on how you can practice the right way, and actually grow faster as an artist because of it. These are things myself and many other artists have come to discover through trial and error and I’m hoping, I just might save you a few hundred hours of aimless attempts to “learn how to art”. That sounds terrifying to new artists, I nearly crapped my pants when he told me. What I learned from this statement is that it is meant to give you an opportunity to give yourself permission to screw up, over and over, and know that you are going to eventually get it down so well that you will be able to draw it in your sleep. Next, I’d like you to consider the following: There is no greater growth of an artist than when they throw caution to the wind and explore with childlike wonder. You can quote me on that if you want. Not sure I got that from anywhere, but I said it one day to a student and their eyes lit up. The reality is, when you try to be another artist, or compare yourself to other artists (especially ones you look up to) you will almost always sell yourself short. If you instead ask, how did they do that? You might find the answer. You might just go running to your art supply stash pull it all apart and start making a mess in an endeavor to understand how it came to be. Additionally, this branches into another section of practice called intentional self study. This is where your greatest progress and understanding of your personal artist style can really be developed. Intentional self study is where you say, “Damnit! I want to learn this and I don’t care how long it takes, I’m going to do so.” I’ve done this a number of times, and it’s always awaken me to something I had missed so many times before. At one point I’d had enough of my own shenanigans and gave myself a stern talking to. I commanded myself to learn how to draw the human figure. Something I learned in middle school, high school, and again in college, but completely failed to fully grasp with expert proficiency. 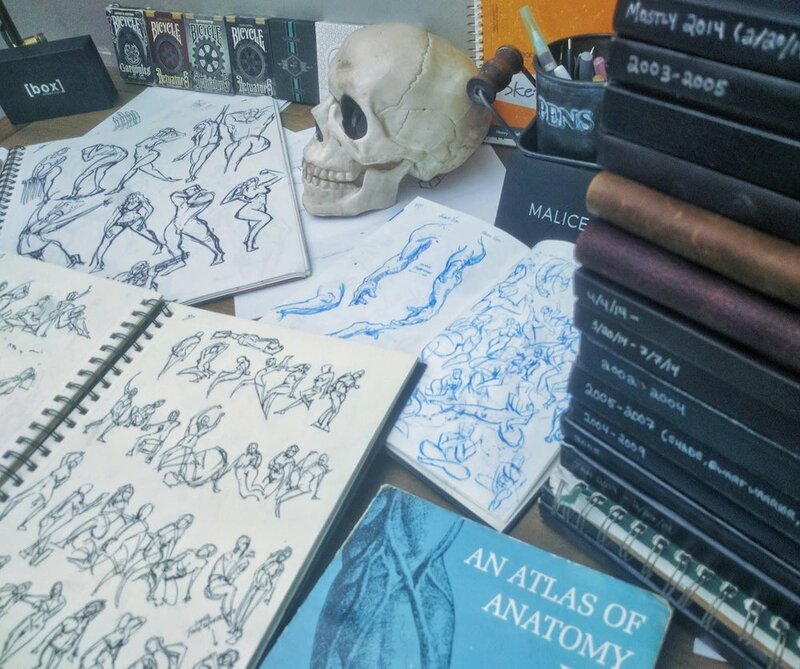 It was on this commandment that I began drawing gesture drawings (30, 60, 90) second poses that challenged me to understand the flow of the human form, then I joined a 100 day anatomy study on conceptart.org. The X’s are of those who did not post art related to the study of human anatomy for 100 days straight, without missing. I was not one of the X’s ;) I was hellbent on learning and I had commanded myself to do so. I worked tirelessly, because of my intention. Finally, the last thing I’ll relay for now is that your sketchbook should be messy as hell, it shouldn’t make sense to just anyone who picks it up, it’s your key to the world around you and you should make it work for you. See a person walking down the street with an odd gait to their step? Try to capture it, Funny looking leaf laying under a frog that’s sitting on a bump of a branch on a log at the bottom of the sea? Draw that goofy scene as best you can! Got an idea for a comic or a series of characters that could make a great team? DRAW THEM TILL YOUR HANDS BLEED! What I mean by all of this is for you not to make the same mistake I did. I used to think every page of my sketchbook had to be this amazing piece of art that would make people squee when they saw them. Do you know what came of that? 1 or 2 pieces of art in an empty sketchbook that became about 12 sketchbooks with pretty much the same fate. Sat in a corner of a bookshelf forgotten along with my promises to myself that I would learn how to make amazing art. I could fill an entire book on the topic of practicing art, (and I eventually might), but for now I’ll leave you with a simple phase, if it’s on your heart, you gotta turn it into art. We’d like to hear from you. Show off some of your sketchbooks and cool art in the comments. Let us know what your favorite practice exercises are, or if you’re not practicing, what are you going to do to get back in the game? !